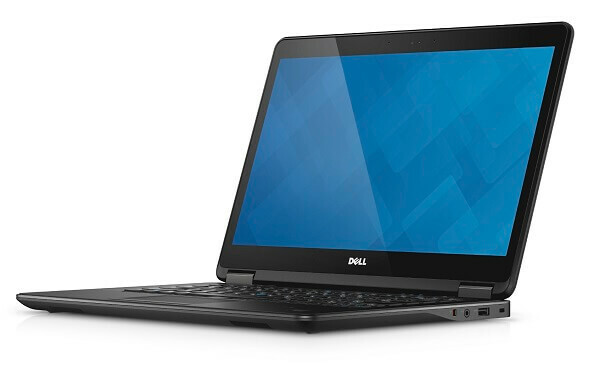 Dell is well known for its ability to produce high quality laptops and ultrabooks that can compete head to head with most portable computers that were designed for business purposes and less so when it comes to entertainment. The way they achieve that is through the very way ultrabooks are constructed – with the basic principle that they employ high-end specifications at the price of battery life. 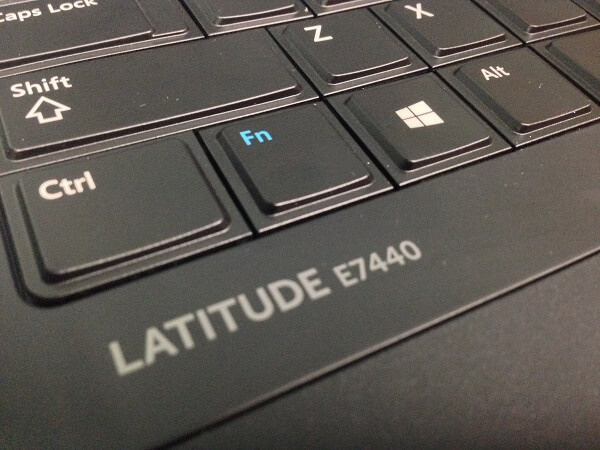 The Dell Latitude E7440 is no exception and is actually forced to face these issues head-on on a number of fronts. It finds itself in the midst of a market that – although not lacking popularity and demand – is not void of many other competitors. Many titles such as Sony Vaio, Lenovo and HP bring their own take of capable hardware into the fray and come at a point where it’s hard to differentiate between the various models. It is also a general rule that most ultrabooks don’t go easy on the price tag either so picking one out for your office-related tasks and needs may be a relatively tricky thing to do. So let’s take a closer look at the Dell Latitude E7440 and see if it has what it takes to come out superior to all the other highly successful models that are present on the market. When it comes to the Dell Latitude E7440’s design, opinions may very well be split into two definite categories. On one hand we can obviously see the build quality and how the way the device is made simply inspires sturdiness. Coming with a durable aluminum exterior, featuring a powder-coated base only hides the real titan that is underneath. The chassis of the Dell Latitude E7440 is composed of a tri-metal compound that has undergone and passed intensive MIL-STD-810G testing. Then, on the opposite end of the rope, you will find opinions of the individuals who prefer devices more like the HP Elitebook Folio 1020 G1. Ultra slim, smooth and sleep looking, the kind that most likely takes its design inspiration from Apple devices. 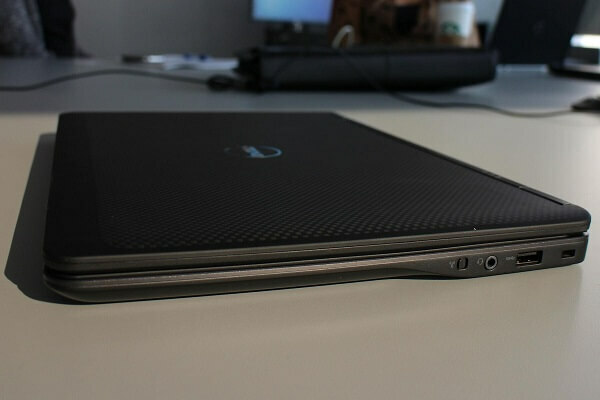 Compare the Dell Latitude E7440 to one of those and the ultrabook suddenly feels bulky, heavy and thick. Even if the numbers do not necessarily pertain to these impressions. 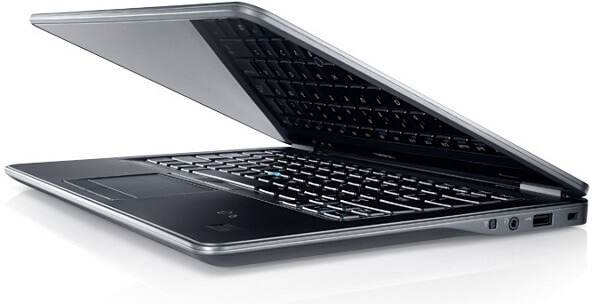 The overall dimensions of the Dell Latitude E7440 are 13.2 x 9.1 x 0.8 inches in width, height and thickness, weighing a total of 1630 grams with the battery included. 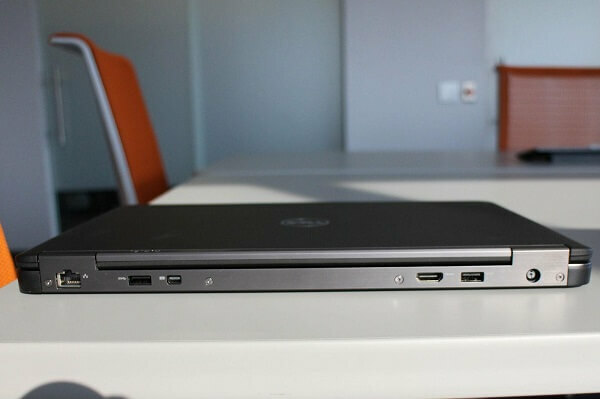 Compare it to HP EliteBook Folio 1020 G1’s dimensions: 12.2 x 8.27 x 0.62 inches and 1200 grams in weight. The difference is not immense and yet, the overall feel of the Dell is a lot different than the one of the HP. The outer shell featuring metal and carbon-composite materials used in its construction doesn’t exactly spell out sleekness and a suave coat of delicacy hiding the great power that the ultrabook has inside. It goes for a matte black finish instead (at least on the default model). The lid is made of a soft-touch carbon fiber material with a rugged surface. The hinges that connect the lid to the body of the Dell Latitude E7440 ultrabook are made of reinforced steel and allow the lid to open up to a satisfactory angle. 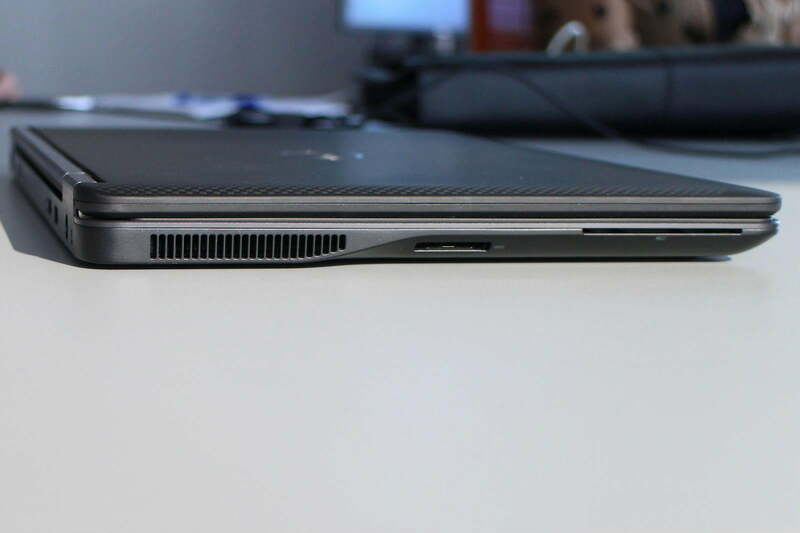 In terms of port placement and more specifically the types of ports that the Dell Latitude E7440 offers its user, it’s obvious that the ultrabook takes upon its role of a business laptop seriously. You can find an USB 3.0 port on the right hand side, along with the wireless switch and a 3.5 mm headphone jack slapped in between the two. On the opposite side you can find the SD and smart card ports. On first look you’d think that’s about it, but the back edge of the Dell Latitude E7440 hosts many surprises. You’ll find another 2 3.0 USB ports, a mini-DisplayPort (surprisingly to say the least), an HDMI output and a full-fledged Ethernet port to allow direct connectivity to the internet. 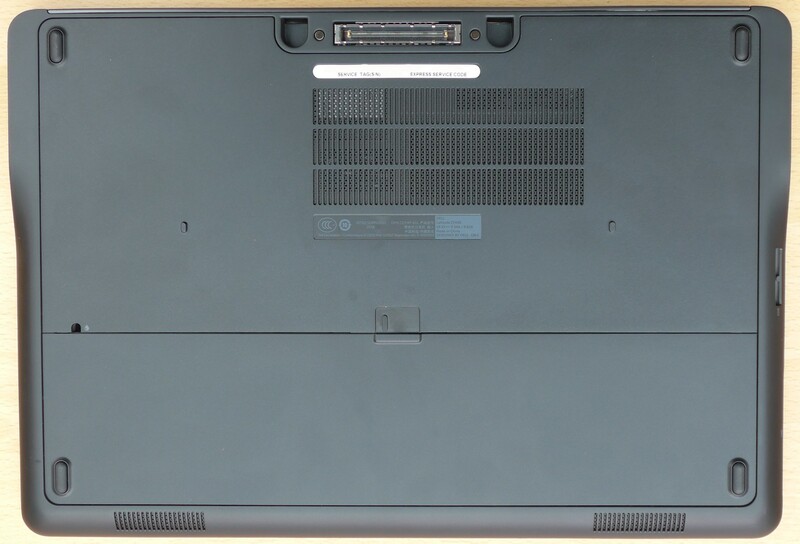 While the mere presence of an Ethernet port is something extremely well received on laptops in general and – to some degree – excuses some of that extra thickness that the Dell Latitude E7440 packs, the decision to place some of these ports on the back of the E7440 is not optimal. The HDMI and mini-DisplayPort were wise to be placed there, but you may find that USBs are not that pleasant to reach and operate when on the back of the ultrabook. 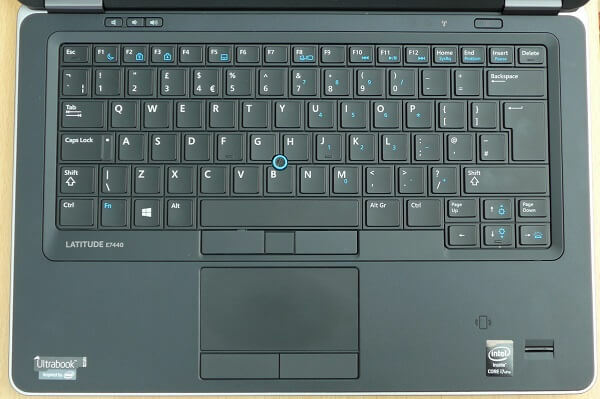 For some reason, the designers decided to place the LEDs that signify whether the laptop is on and/or connected to power on the back too, which is a bit of a baffling fact for me. Probably part of the reason the Dell Latitude E7440 jumps so high up on the price scale on some of the configurations as there is an optional touchscreen capability included in the list. On the other hand, the default model only hosts a matte finish display that helps reduce glare and makes for a fairly bright screen scoring 351 nit brightness peak. The 14” display is undeniably a strange size to go for, being marginally larger than the classic 13.3” but not quite as large as the 15” version that laptop models usually aim for. However, the display can go up to a resolution of 1,920 x 1,080, giving anything you view on it an amazing amount of sharpness and detail. Some figures suggest that the Dell Latitude E7440 display isn’t quite the perfect tool for color accuracy – scoring an average DeltaE of 7.6. In other words, any kind of work regarding graphic design that relies heavily on color hues would not render you amazingly great results if you were to use the E7440 for it. The display is a LED-backlight LCD which means that although you get a great, crisp quality along with it, it is one of those devices that are particularly power hungry and tax your battery a lot more. You may find yourself tinkering with the display’s brightness settings to manually reduce power consumption when on the road for example. If you opt for the touchscreen capable display, the price does spike up a fair amount, but you’ll find the screen to be responsive and resilient. Covered from edge to edge with a layer of Corning Gorilla Glass NBT, the display doesn’t seem to collect smudges and fingerprints. There is a fair amount of tweaking you can do before you purchase one of the Dell Latitude E7440 ultrabooks in the sense that they offer a variable setup depending on how much power you are truly looking for in a business laptop. The basic model will offer you a 4th generation Core i5 processor (either the 4310U, 4300U or the 4210U versions), 4 GB of DDR3L @1600 MHz RAM memory, Intel Integrated HD Graphics 4400 and a regular 500 GB SATA hard drive. If we are to take only that amount of specifications into account, then you’ll find that the Dell Latitude E7440 ultrabook has more than it would ever need for a business laptop. Depending what your line of work really implies, but the hardware that has been put into the 0.8 inches of thickness should more than suffice your office work smoothly and without interruption. While the core processing unit is a relatively old piece (released somewhere in 2013), it’s still a fairly fast processor that makes use of an internal, integrated GPU to handle the graphic rendering of programs and applications. That being said, this is not the kind of laptop you’ll be using to handle graphic design or music production as it will turn out to be quite overwhelmed by that degree of hardware requirements. However, all office work-related types of activity will have little to no problem being handled by it. Multitasking capability is empowered thanks to the generous amount of RAM and the highly capable processor, however. While I have mentioned this before, the fact that Dell Latitude E7440 offers you Ethernet connectivity is something that you rarely find on laptops and notebooks alike these days and will give you the best an internet connection can ever offer. 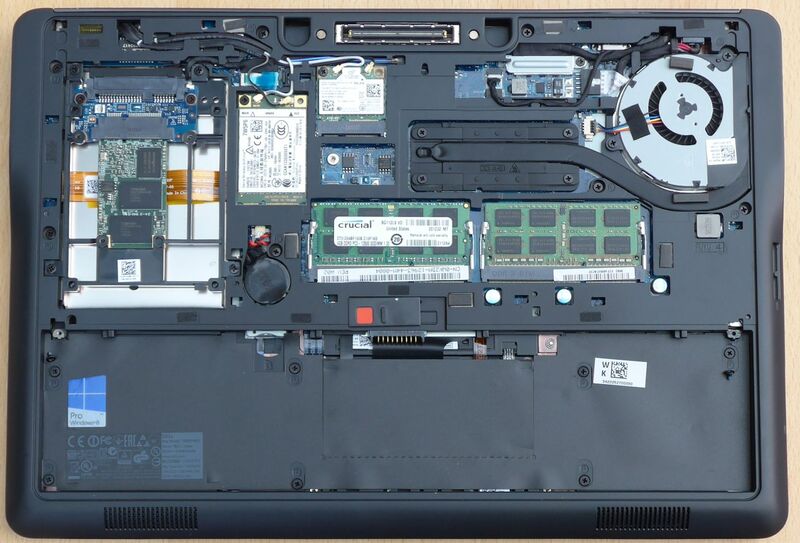 The Dell website lists the best configuration that the Dell Latitude E7440 ultrabook can go up to as being a setup that makes use of aan Intel Core i7 4600U model, up to 16 GB of DDR3L @1600 MHz of RAM and a 512 GB Solid State hard drive. While the addition of an ultra fast SSD hard drive into the fray is something that any user will be thankful for, there doesn’t seem to be any possible upgrade to the graphics processing unit. Meaning that neither does the integrated GPU receive an uplift on the high-end version of the Dell Latitude E7440, but there is no option to add a dedicated card either. 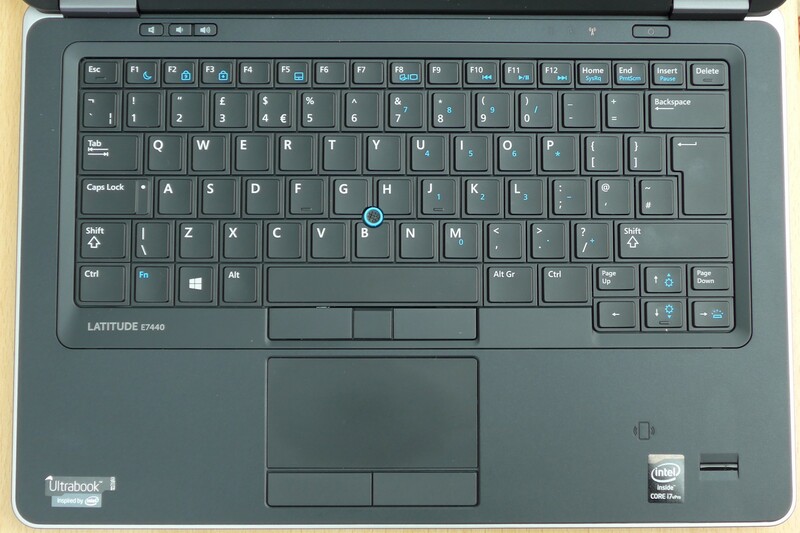 The keyboard that the E7440 ultrabook comes with is a fairly capable addition to the laptop, albeit it lacks a full format – the type that incorporates a num pad on it too. You do, however, still get all the necessary utilities on it, along with basic controls made available through the function button. There is also a tiny, blue pointing stick in the middle of the keyboard that will allow you control things from that side just as well. The keys are separated from one another, improving your accuracy by a decent amount. The buttons overall feel punchy and responsive without being noisy. There is a small issue with the central part of the keyboard as it tends to feel bouncy and a little too flexible. However, that has not felt like a huge hindrance from a proper typing experience so far. The most notable part of the keyboard is the existence of backlighting possibilities. Once again, the type of feature you don’t realize the true benefit of until you’ve tried it, but backlit keyboards can be a lifesaver in multiple situations. And because the backlighting has 4 separate levels, you can adjust it as needed to reduce power usage for example. One of the biggest issues that anyone who has ever used a laptop will most likely report will be the accidental tap they may do onto a touchpad without realizing while editing a document, resulting in multiple moments of frustration. 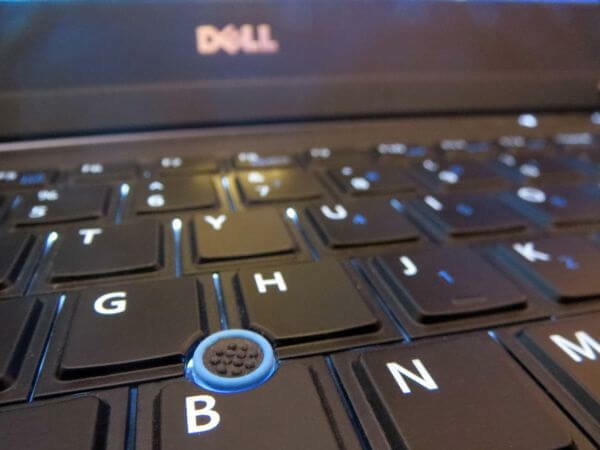 While the Dell Latitude E7440 didn’t seem to display such an issue with the trackpad, there is a chance you may fall in a similar trap with the track point instead. Regardless, the trackpad itself feels smooth and highly responsive and comes with the better alternative of two separate buttons placed at its bottom that will mimic their correspondents on a mouse. It’s been built to support Windows 8’s gestures so you will be able to make use of some degree of multitouch control. Because no ultrabook can truly be taken seriously as a business laptop unless it offers some degree of security, the Dell Latitude E7440 has brought its own input in this perspective with both default and optional security options. The ultrabook is equipped with the latest Intel vPro technology which allows both secure activity as well as remote access and control features. Encryption, contact-less smart card readers, secure credential storage thanks to a FIPS 140-2-certificed TPM, Dell ControlVault meant to apply another layer of hardware security – all these are security features that you can make use of on the Dell Latitude 7440. Unfortunately, however, most of them do not come by default and will only be able to be obtained as an optional purchase or only available on the higher end models of the Dell Latitude E7440. A very good example is the feature that allows remote data deletion through an Intel vPro extension. 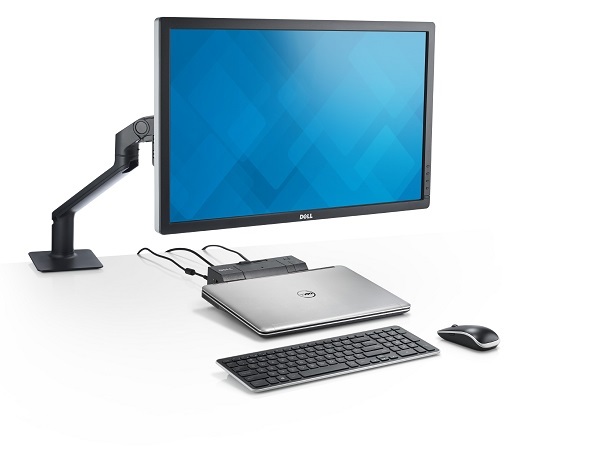 And while we are on the topic of optional purchases, Dell offers a docking port that is priced at somewhere around $270 which will allow you laptop to connect wirelessly to peripherals such as mice and keyboard as well as monitors. While this is one way to not have to rely on external cables, it is not as highly performant as a straight out, cabled connection. The battery life of a portable computer, and an ultrabook meant for business purposes at that, is one of the most important aspects that you should worry yourself with. Sadly, the 4-cell 45 Whr Lithium Ion battery did not seem to fare amazingly well. With brightness set on medium and basic office work usage, an entire charge lasted somewhere around 7 hours at best. And it’s quite a shame that you can’t exchange your battery for a stronger power pack either as the 45 Whr seems to be the most capable available pack on the Dell website. Charging, however, seems to be fast enough as it will most likely take between an hour and an hour and a half to get a full charge back on this Dell Latitude Laptop. All in all, the Dell Latitude E7440 seems to be a very sturdy choice for anyone willing to purchase a business ultrabook. The website and qualified retailers seem to offer a fair amount of customization along with it, even though two major aspects of it are bluntly left out. More specifically, the GPU and the battery power pack. The downside of the laptop in question is, however, its pricing. While a lower end model of it won’t take you much higher than $850, the high-end spec versions can go to as much as $2,000. Surely, most of that would be caused by things such as touchscreens and other optional features, but it’s still something to take into account, especially given the fact that you’re not exactly getting the absolute best hardware specs out here with the Dell E7440. 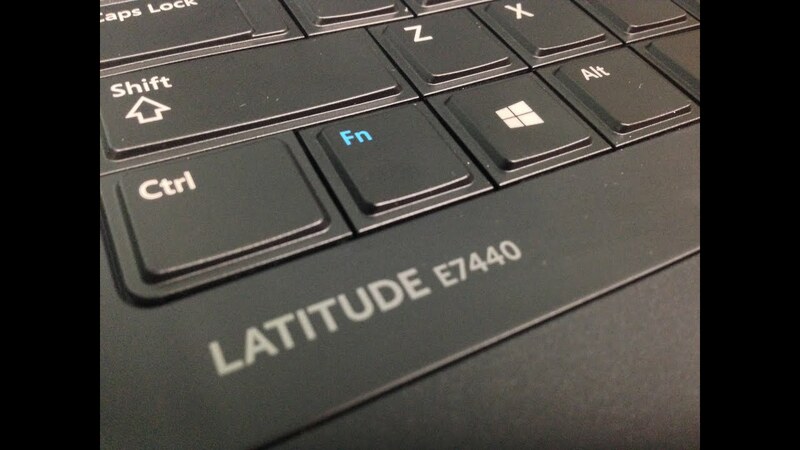 However, in the end it comes up as being superior to many other Dell business laptops, thanks to the Latitude E7440 specs but design and resilience too.